Steven Matz has endured one of the most stressful and unexpected journeys of any player in the New York Mets farm system. Selected in the 2nd round in the 2009 MLB Draft, it’s taken Matz four years to pitch in full-season ball. But he’s finally here. 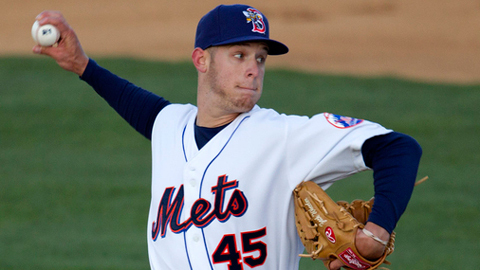 After Tommy John surgery and two years of rehab, Matz debuted with Kingsport in 2012. Matz impressed in 6 starts, striking out 34 in 29 innings of work, while keeping opponents hitting .158. On the bad side, he was prone to giving up the walk, walking 17 in his limited innings. Matz was temporarily shut down with arm troubles and understands that the 2013 season is important for him. Former Cy Young winner and current Savannah Sand Gnats pitching coach Frank Viola went more in-depth about the scraping of the curveball and how the “slurve” benefits Matz. In that West Virginia start, Matz struggled to stay in the game. He was yanked after reaching his pitch count in 4.1 IP, allowing two earned runs on four hits, while talking two and striking out three. Frank Viola believes that start was the start of a new side to Matz. Viola hinted that Matz may not be around when the All-Star game comes around. Matz could be on the fast track to St. Lucie, but it all depends on whether the lefty can stay healthy. “I really believe he’s that close to really putting it together,” said Viola. Questions continue to loom over who will be starting where in the outfield, especially in centerfield. And Matt den Dekker still isn’t the answer. After the first ten rounds, the Mets philosophy is structured around saving money. The front office has not necessarily drafted the best players available, but after sleeping on last night’s decisions, I’m actually humming a different tune. The Mets seem to be drafting pieces, instead of players, which isn’t necessarily bad. By this, I mean that the team isn’t trying to find the next superstar. It’s a philosophy that the Tampa Bay Rays have mastered, which has fueled their success at the MLB level. Here’s my best attempt to explain why they picked who they did and what those players bring to the table. If you haven’t heard yet, the 2012 MLB Rule 4 draft started on Monday. This year is much different from past years, as hard slotting has taken effect. Each team is assigned a certain amount of money, which can be used for bonuses. This prevents big-market teams from drafting players later in the draft who might have gone earlier, but fell due to bonus demands. The draft is modeled with the intent of the small teams getting the better players. It also forces the kids being drafted to decide if they really want to dedicate their lives to baseball professionally, if they aren’t getting first-round money. Last year, the Mets went in a different direction from the past. After selecting Brandon Nimmo and Michael Fulmer, two high school players in the first round, the Mets flooded their draft board with college arms and toolsy high school players. In the past, Mets fans were used to seeing college players drafted year after year. Some say it was used to save money, but at the time, the Mets were in contention or believed to be able to contend. The positives with drafting college kids is that a) they’re fairly well-developed, so you you have a good idea of what you’re getting; and b) they might not require as much time in the minors. The downsides: a) they usually don’t have as much “upside” or projectable talent as a high schooler; and b) you don’t get to develop them yourself. After the jump, you can read my analysis by the New York Mets’ first two selections in this draft. Keep checking back for updates on each pick (until it’s a crapshoot). Johan Santana might have thrown a shutout against the Padres, but he made his best pitch to help those affected by 9/11/01. The Johan Santana Foundation and The Mets Foundation teamed up by donating $20,000 to Tuesday’s Children. Tuesday’s Children announced a new effort to help Spanish-speaking families of the 9/11 community. They strike to help the families who lost loved ones in the attacks or had members that were first responders. New York Mets COO Jeff Wilpon was on hand for event, congratulating Santana for his generosity. Tuesday’s Children is a non-profit family service organization that aims to help those impacted by the events of Steptember 11, 2001. For more information, visit www.tuesdayschildren.org and www.johansantana.org. Here are four questions/statements that you might be asking yourself two months into the minor league season. Is there a true ace in the Mets system? One of the biggest weaknesses within the Mets organization is the lack of a bonafide #1 starting pitcher. Many fans believe that Matt Harvey is going to be that ace. But the rest of the league looks at him differently. Most see Harvey as a 2/3 starter. But that doesn’t mean there’s not a true ace down in Binghamton. There’s the case of Zack Wheeler, the lone piece acquired for Carlos Beltran at the deadline last season. Wheeler has dealt with control issues throughout his career and he’s dealing with them again. However, the walks tend to get lost behind the blazing fastball, and strikeout totals he pumps out in each start. After a rocky debut, Wheeler has really shined in Binghamton. He’s K’d 29% of the batters faced, keeping hitters in the Eastern League at a .189 AVG. He has a WHIP of 1.17 and his BABIP is .279, a huge improvement from last season (BABIP .361). The negative part of Wheeler’s game is his inability to control all pitches. He walks 4.54 per game, a 3-walk increase from last season. Keep this in mind when you try to explain that he deserves a promotion to Queens. It’s one thing to have the shiny numbers, but real success is when you can locate and control all pitches. He’s starting to come into his own and Mets fans should be excited. Wheeler has dominated Double-A hitters and looks destined for a call-up. Get ready for Wheeler in 2013. Ike Davis gives me headaches. I throw on the Mets game after a friend told me what Kung Fo Panda just did. After watching Dillon Gee struggle, I get to watch Ike Davis strike out looking with the bases load in the 8th inning against the San Francisco Giants. The Mets would lose 7-2. After striking out, Davis properly mutters something he shouldn’t have, and throws his bat like an underhand toss. He un-straps his batting gloves and proceeds to look up to the sky as if the answers lie there. But the answers lie in his attitude at the plate. There was never anything phenomenal about Fernando Martinez. He was signed out of the Dominican Republic in 2005 by explorer Omar Minaya. Minaya seemed to have some success in the past down in those waters, but Martinez was supposed to be the top prize. After years and years of hearing he was the future, the love story has finally come to an end. Fernando Martinez is now a Houston Astro thanks to Sandy Alderson placing him on waivers. It seems like only yesterday F-Mart was the talk of the town. He was that can’t-miss prospect that all publications were drooling over. But quite frankly, he wasn’t all that good, ever. As I look at it, Fernando Martinez is that toy you got on Christmas. You remember that toy, don’t you? For me this year, it’s the Kindle Fire. When I first got it, I couldn’t put it down. I was browsing all over the internet, syncing my emails, downloading books, etc… Fernando Martinez was that toy for a while. He was the number-one ranked prospect in the Mets organization in 2007 and 2008. I’m sure you know that by now. He once was the 20th-best prospect in all of baseball. That was four years ago. As the weeks have gone on, I don’t play with my Kindle as much. I read three novels on it (Read “The Art of Fielding” by Chad Harbach; great novel). I look at it and ask, “What else do you have to offer?” Fernando Martinez is my Kindle Fire, minus the various features and apps. He offered me so much promise, yet will remain behind my Macbook and iPhone. Fernando Martinez is that old toy. I don’t really know what to say at this point. Martinez once ruled the baseball world like Queen Elizabeth. He looked good very young, but grew old very quick. But what was really so attractive about Martinez in the first place? His best WAR was a 1.5, which happened in 2008, which caused the Mets to believe that he was ready. He was not. His career minor league slash: .274/.333/.443. Not impressive. While scouts raved about his fielding, we all will remember him for falling flat on his face, going after a ball in Milwaukee. That’s what all of baseball remembers him as. He never developed the power that fans thought and quite frankly, I don’t think he’ll ever be a third of what he was hyped to be. As the Fernando Martinez era has come to a close in New York, let him serve as a reminder. STOP OVERHYPING PROSPECTS BECAUSE PEOPLE LAUGH AT US! Add Martinez to the list of Alex Escobar, Alex Ochoa, Lastings Milledge. Coming soon will be Wilmer Flores because he’s showing exactly what Martinez showed: heartbreak and nothing worth playing with the next day. Sure I am bitter. I want the Mets prospects to pan out and lead us to the promise land. But why does it always happen to us? Why can’t it happen to the Yankees? Or the Phillies (crosses fingers: Dominic Brown)? Maybe Fernando will find himself in a new city. Houston, we have lift off!